Founded over 2,500 years ago, Cartegena is proud of its Roman history. Numerous signs point to the first-century BC Roman Theatre in the town centre. It took twenty years to excavate and restore it and we thought it would be worth a visit. Following the ‘archaeological route’ on the map we began by walking along the ancient city walls – which have also probably been restored since they are in remarkably good condition. Along the old, narrow streets were more examples of Cartegena’s ongoing architectural restoration projects. The facades of beautiful old buildings were shored up with scaffolding. The interiors have been demolished but the patterns of staircases were still visible on some of the walls that were standing. 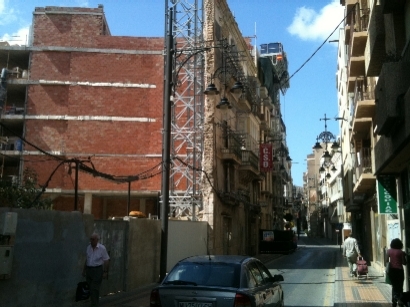 Whole streets were being restored and we saw examples of ones they’d ‘prepared earlier’. The photos show how elegant they look. To get to the Theatre you enter the museum, a modern building in the town hall square, where exhibits, photos and signs explain how the theatre was discovered and restored. An underground passage and an archaeological corridor constructed underneath a church in the town connect the museum with the Roman Theatre. These have walls lined with information and videos about the Emperor Augustus (who commissioned the theatre in order to make Cartegena officially part of the Roman colony) and the type of plays that would have been performed, along with items such as pots, coins and jewellery found during the excavation. At the end of the corridor you suddenly you find yourself in the bright sunlight and looking at the impressive sight of a Roman amphitheatre. Despite the heat we spent some time walking around the radial stairways, outer walls and performance area, admiring the views over the town and sea. For lunch we found a tapas bar in the old part of town which looked a bit like an English country pub inside and was lovely and cool. The food was all on display under covers along the bar so you could just point at what you fancied. We’ve learned the phrases to check things are meat-free but sometimes people have assumed that both of us are veggie. Paul did manage to get some fish and sausage dishes this time though. In contrast to a cultural morning learning about ancient history, the rest of the afternoon was spent in Il Corte Ingles, a huge 7 floor department store similar to John Lewis and great for browsing luxury goods. I bought a hat because mine had ended up in the sea a few days earlier and Paul bought a stylish ‘man bag’ as he calls it. We also bought what must be the world’s most expensive potato masher (9euros!). After stocking up on provisions from the food department we got a taxi back to the boat. 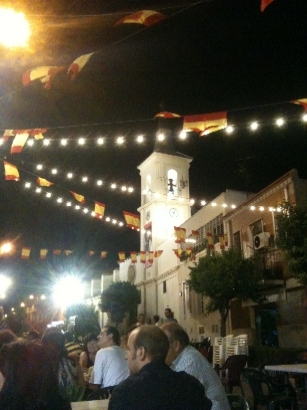 This evening there was to be a flamenco performance in Santa Lucia – a square a few streets away. I’d never seen one and Paul loves flamenco. It was due to start at 10 so we got there just before and found a table near a small, pretty lit-up church. The square was decorated with fairy lights and there was a distinct ‘local party’ atmosphere. Large family groups were arriving and ordering tapas and drinks from the one restaurant or small kiosk opposite. The two waiters from the restaurant really earned their money that night. The performance didn’t begin until 11 but it was pleasant to sit and watch people and soak up the atmosphere while drinking wine. Paul didn’t think I’d like the music and the website described this as an authentic, emotional and powerful example of flamenco, with the music ‘rooted in the suffering and abuse endured by Spain’s gypsy population’. There was even a recommendation on the site to sit at the back for a hasty exit in case it got too much! I loved it and would have happily sat for another hour if it had carried on. The singer and guitarist were so talented. The singer gesticulated wildly and his face expressed the angst and tortures and suffering the songs were about. Perfect for me really and Paul enjoyed it.